Capture your memories of the ceremony with a Ceremonial Flag and Medal Display Case. With this fabulous casing, you are able to create a perfect display for your 5Ft x 9 1/2 ft flag and accompanying awards or medals. This glass-fronted Memorial Flag Case comes with an acrylic front display area and with turn-button closures on back of both compartments. This very handsome flag case preserves and proudly displays the standard memorial flag when folded into a triangle. The burial flag, or any flag you choose to proudly display, is easily inserted by removing the back. Velcro-friendly backing makes for easy mounting of memorabilia. As a combination unit, the Ceremonial Flag and Medal Display case accommodates a 5-ft x 9.5-ft flag. Solid hardwood construction of beautiful design and construction differentiates our cases from others. Our items are crafted in genuine hardwoods, material as durable as it is attractive. Red oak is hard with a well-defined grain pattern, and it looks best when given our natural finish. The flag display cases at flagsconnection.com are made of oak and are sturdy and heavy. A glass door keeps inquisitive fingers away, as well as dust. The black fabric background creates a stunning display. 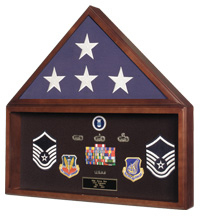 Order this military or memorial flag and medal display showcase for displaying military lapel pins, medals, buttons, ribbons, patches, badges, insignia, and other treasures. Our Ceremonial Flag and Medal Display cases are made with a sense of pride and respect for craftsmanship. Designed with the timeless elegance of fine furniture, the case fits perfectly in most any setting, whether in a corporate lobby or on a wall at home. Quality finishes accent the exterior of this walnut display case. The hardwood frame is finished in a handsome Heirloom finish. Wherever you choose to display it, it's the clear choice when only the best will do.